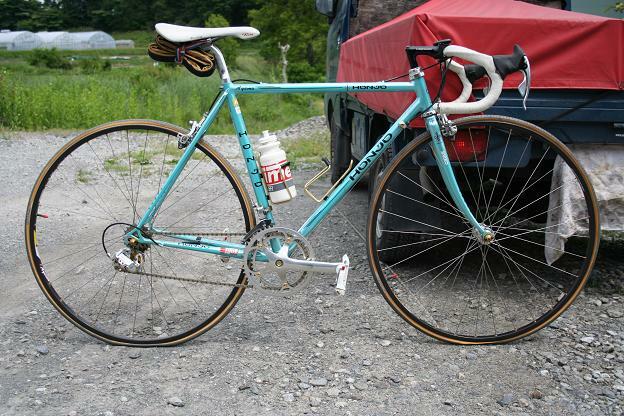 Further searching through Japanese cycling pages led me to this guy’s site that seems to have a lot of retro bikes, if by “retro” you mean 1992. Because I don’t find any bike much older than that pretty or fun to ride. Give me index shifting or give me death! I’d rather revert to chamber pots and Crosby, Stills, and Nash than center-pull brakes. Which is not to say that all things that are from that time period are better. Take the Specialized tires on this otherwise tasty Honjo Cycleworks road bike. The Specialized Umma Gumma tire constituted my first experience with road tires. They had this grey tread compound that eschewed carbon black so that the tread would be extra grippy, but instead of substituting some other linking additive like silica, the Specialized Umma apparently had nothing to toughen the tread. The result was that these tires punctured if you looked at them too long. I became a master of patching tubes and booting tires, because I just assumed that such skills were common to any serious cyclist. Without a doubt, some of the worst tires I’ve ever owned. Oddly, the photograph has a spare tubular under the saddle, whereas the tires and rims are clincher. Other than tire follies, this Honjo is a very nice example of late 20th Century steel. I’m not one for fancy, ornate lugs like the Nervex-knock offs that all the new framebuilders today seem to love. Give me clean, short-point racing lugs or in this case fillet-brazing, maybe an interesting chainstay section. Some strong forged dropouts. And that pearlescent aqua paint is so simple, so delicious. No unnecessary details like a bottle opener. Clean.